Water Color Stripe Petite Tee is rated 4.8 out of 5 by 8. 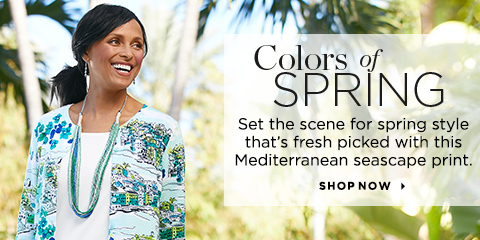 An aquatic-inspired pattern lends a serene feel to this comfortable, lightweight tee. Rated 5 out of 5 by MaggiesMom from A cool shirt for summer. I live in a hot climate in the summer and need light weight tops with coverage. This shirt is just right. Ordered PXL. I’m 5’4” and it fits great. Not tight in the stomach area and not too long. It will go nicely with denim, white or navy capris. Rated 5 out of 5 by MLT64 from Cute shirt I saw this as part of an outfit hanging in the store and after going back to the store a few times, decided to buy the whole outfit, which included a sweater and necklace. I love how C&B puts things together in the store so you can buy things that go together and look great. Rated 5 out of 5 by jam1990 from Comfortable! I ordered this for Spring and I love it. Comfy, easy to care for and looks great with jeans or slacks. I wish there were more colors! Rated 5 out of 5 by dianek from Birthday Present for a Friend I bought this top for my friend's birthday and she loves it! Wears and washes well! very flattering and perfect for Spring! Rated 5 out of 5 by Marty227 from Love it Looks great and does not wrinkle, easy to laundry wash and hang to dry.would love to have it in other colors! Rated 5 out of 5 by Smedley AZ from So comfortable Am glad the weather is warming up so I'll be able to wear this top soon. Very comfortable and fits me nicely. Rated 4 out of 5 by sm nana from Comfortable fabric and lightweight. Our weather is still very cool so I haven't worn this top yet. Hope to pair with a vest when it warms up. Rated 4 out of 5 by .............. from Cute The neck was a little big, but I will wear it. Wasn't as pleased as I was with the other top.